Or more particularly let’s talk about tax and fairness. On leaving the bureaucracy last year there were two issues that drove me absolutely mental and I wanted to put my energies into. The first was the rising prison population at a time of falling crime rates and the second was homelessness. Since then with the former I have become the policy coordinator for JustSpeak and a trustee for Yoga Education in Prisons Trust. For the latter – zip. So with that in mind I went to a recent Labour Party thing on Housing stuff. But about mid way Phil Twyford said that the Labour Party in its first term of office was going to do a comprehensive review of the tax system to improve its fairness. Now I have heard them talk about this before – but comprehensive review. Wow. Since then Andrew Little has said they aren’t putting up taxes. So maybe this means this working group will be ‘tax neutral’ in the way Bill English’s was? Now on the basis that this isn’t simply code for a capital gains tax, I thought I’d do a bit of a scan as to what this could mean in practice. My focus will be on the revenue positive items as the tax community will have their own laundry list of revenue negative ‘unfairnesses’ they will want fixing. But first I am going to get over myself. Yes fairness could mean a poll tax but when the Left talks about tax and fairness it is implicitly a combination of horizonal and vertical equity. Horizontal equity where all income is taxed the same way and Vertical equity where tax rises in proportion to income. Now the most obvi unfair thing is the way capital income is taxed more lightly than labour income. Always loved Andrew Little’s comment about the average Auckland house earning more than the average Auckland worker. Dunno why he doesn’t use it more. Long periods before it is realised. Is it fair to tax people when don’t have cash to pay the tax? Valuation issues. Although this goes once move to realisation based taxes. International norm. Soz unfortunately everyone taxes capital more lightly – sigh. Lock in effect. If have to pay tax would you ever sell? Incentive for entrepreneurship which is a good thing apparently. Oh and not being able to get elected. Options include a realised capital gains tax or Gareth’s wealth taxation thing. Both have issues but both would be an improvement if fairness or horizontal equity is your thing. Alongside the not taxing capital gains is that we don’t tax imputed rents. Remember how owning your own home is effectively paying non-deductible rent to yourself and earning taxable rent? Except the value of the rent is not taxed? Awesome. But its non-taxation also offends the horizontal equity thing – even if it is your house – and so is unfair. New Zealand companies that earn foreign business income in their own names are taxed. New Zealand companies that earn foreign income through a foreign company aren’t. Why? International norm. Not fair but everyone else does that too. Also brought in by Michael Cullen. Nuff said. While Gareth’s thing is potentially wealth taxation it really is taxation of an imputed or deemed return on wealth rather than a tax on wealth per se. 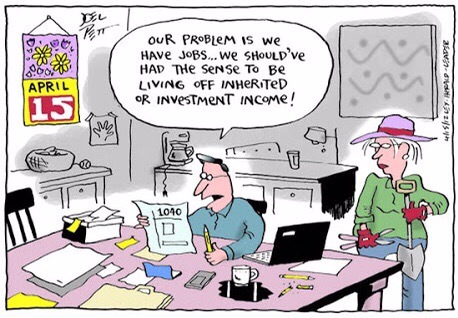 Actually taxing capital or wealth is where inheritance or gift duties come in. Now neither of them are actually income taxes. They are outright taxes on capital. And if that capital arose from taxed income then would be very unfair to tax. However not entirely sure that is the case and these taxes are relatively painless as they tax windfalls; don’t effect behaviour and only apply to the well off. So they potentially promote fairness from a ‘reducing inequality’ sense rather than a horizontal or vertical equity sense. Foreign banks have their interest limited in a way foreign finance companies don’t. Forestry gets deductions for all it costs decades before any income is earned. Now this isn’t an obvious one as everyone can get a third back of their donations up to their total taxable income. So that is pretty fair. But the more taxable income you have the more subsidy you get. And it can go to a decile 10 school; your own personal charity or a church with an interesting back story. But dude – seriously – who can afford to give away all their taxable income? Perhaps worth a little look. Labour income that is earned as an employee is subject to PAYE and no deductions are allowed. Labour income that is earned as a contractor is only sometimes subject to withholding taxes and deductions are allowed. Aside from deductions which are likely to be pretty minimal with most employee type jobs – there is an evasion risk when people become responsible for their own tax. Spesh when such people are on very low incomes. Whole bunch of other ‘fairness’ issues too like access to employment law; but this is just a tax post. Labour – and any income – can also be earned through a company. And a company is only taxed at 28% while the top rate is 33%. So if you don’t need all that income to live off you can decide how much stays in the company and how much you pay yourself. Is that fair? Now of course there is always the old staple – increasing the top marginal tax rate. And yes that does enhance vertical equity but it also causes other problems elsewhere. So if you are going to make the system more misaligned please make sure that it doesn’t become the backdrop for widespread income shifting as it did last time. Oh and secondary tax. Now there are many things that are unfair including precarious work and over taxation. Not sure secondary tax is one of them. While you have a progressive tax scale and multiple income sources – you get secondary tax. It appears that under BT – page 22 – the edges can be taken off getting a special tax code which should help but secondary tax in some form is structurely here to stay. Look forward to it all playing out. Disappointing that Labour in the reform space only talking about pushing bright-line tax out to 5 years. I suspect that that there may now be a surprising level of public support for taxing all residential investment property sales. Simply extending the bright-line to 5 years will mainly just turbo charge the lock-in effect. I think that most people would think it would be fair to bring into the net this big dollop of untaxed income – it’s also something that most people can get their heads around (unlike imputed rents). Don’t agree that it’s unfair to apply inheritance-type tax to capital sourced from taxed income. Inheritances are Haig Simon’s (ie economic) income to the recipient regardless of source so, as you would say, game-on. But such a tax is unfortunately currently a non-starter while we have free capital and people flow to Australia and that country does not reinstitute such a tax. Which is a shame as I consider such a tax to be a worthy component of fair tax mix. Given that the 28% is a rort for higher income taxpayers only one hopes it is on Labour’s agenda! Then there are land tax (a form of capital tax, but I believe quite different in terms of effect), consumption tax, excise tax (I assume that is what they call that outrageous fleecing of tobacco smokers at present?) and resource tax (I think TOP have proposed one of these too?). Also, I was surprised by the pie chart of the proportion of tax types that make up the government’s revenue – I’d be interested in what you would see as the ‘ideal’ proportionality Andrea, if fairness was taken as the main objective in a redesign of the tax system. Maybe a future post? :-)! Thanks Katharine. All good points. I don’t think I had ever thought of a land tax within a ‘fairness’ frame but yes I think that is valid in terms of a reducing inequalities perspective. I also hadn’t ever thought of tax mix in terms of fairness. I do know something like 45% or so is PAYE and withholding taxes which instinctively seems a bit high. Unless of course you see company tax as being borne by consumers – some of which could be – in which case it is probably about right. I’ll have a think about it but while I have an economics degree I am not an economist and so is probably outside my competence. But possibly not yours? Or it is simply a political call based respective ideologies. I was really surprised when I first came across that. Makes you really appreciate where Gareth is coming from. And of course with GST at 15% – well, pity the low income households for sure – no wonder we have a child poverty problem. I’d really like to know what percentage of that GST is food. I think the reason for the lower PIE rate started with the fact that there were still ‘closed’ super funds that were taxed at the lower rate. Therefore in order to make the PIEs attractive for top rate people the tax rate had to be comparable. However that was from a place of PIES being diversified investments like the super funds. At some point single investment PIEs became possible as could 100% investment in debt. It was then a small simple step to cash PIEs. I dont think it was at all intended but too hard to unwind once occurred. Maybe because the co rate is 28%? Could we not require that Gross PIE income is imputed like dividends are – they collect this on an individual level? You could but the widely held super funds also get the company tax rate – so you would be back with the issue of PIEs not being comparable. I don’t know how many of them are still around though so as time goes on – possibly less of an issue. I agree. None of this is insurmountable. Just requires a political will to change and the intestinal fortitude to increase tax on savings. But you are right this is also a tax ‘fairness’ thing that can go on the list.